If you think you might need to straighten your teeth for better smile, but wearing metal braces does not sound appealing, Invisalign may be the right choice for you. Invisalign uses a series of plastic aligners to gradually straighten your teeth and shift them into place. 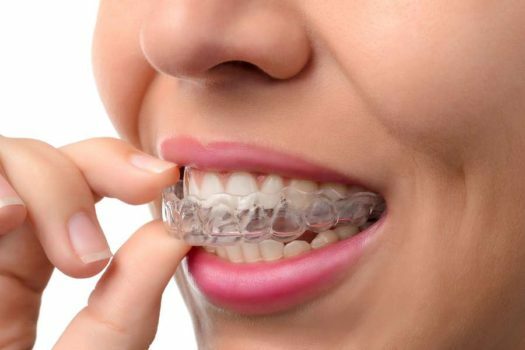 All aligners are custom-fit trays made of clear, see-through plastic that does not irritate your gums and mouth like metal braces do. Invisalign aligners are practically invisible, comfortable to wear, easy to clean and completely removable which enables you to brush and floss without a hassle! Invisalign is suitable for both teens and adults! Before the actual treatment you will have the consultation with one of our dentists who has completed the Invisalign training. During the consultation, the dentist will determine if you are the right candidate for this kind of treatment and answer any questions you may have about Invisalign. If you are the right candidate, the dentist will create the individual treatment plan that will meet your specific needs and provide you with the series of custom-made plastic aligners. In order for the treatment to be successful you will be required to have regular check-ups with your dentist to observe your progress. For adults the treatment usually lasts for about a year, while for teens the treatment will take more time to produce results.